As the poster says, it’s fast, it’s furious and the stakes are high. 8 players and it’s winner takes all – £20,000! 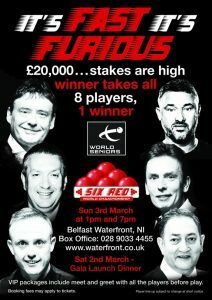 On Sunday 3rd March, the 8 players will play for the £20,000 first prize, and the title of World Seniors 6 Reds Champion, at the Waterfront in Belfast.